Available only through a Veterinarian. Factors such as age, excess weight or congenital defects can affect your dog's joint health and his or her mobility. 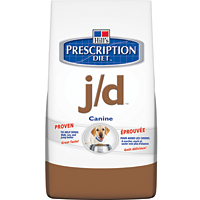 Poor joint health can lead to discomfort in your dog. The food your dog eats plays an important role in his or her overall health and well being, and the right nutrition can help your dog maintain healthy joints and help improve his or her mobility. At Hill's, nutritionists and veterinarians have developed clinical nutrition especially formulated to help support your dog's mobility. ***NOW also available in Feline formula!! Controlled calorie content and added L-carnitine help maintain a healthy weight and avoid extra stress on joints. Because the right nutrition can positively impact your pet's quality of life, Hill's, nutritionists and veterinarians developed Prescription Diet? 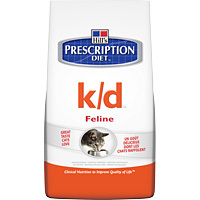 k/d?, clinical nutrition especially formulated to support your cat's kidney health. In fact, k/d is clinically proven to improve quality of life in cats.